Simply select fields in “Match Fields” field. 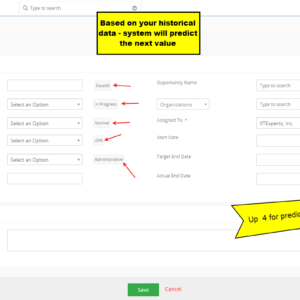 It will search duplicates depending upon the selected fields and show all records. 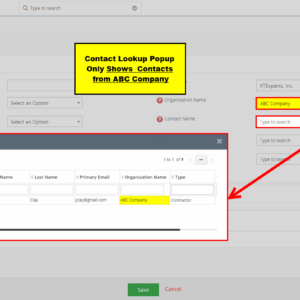 In our example, if you select “Primary Email” field in “Match Fields”, it will give all the records from current module with duplicate emails. This is the available functionality for standard duplicate finder. 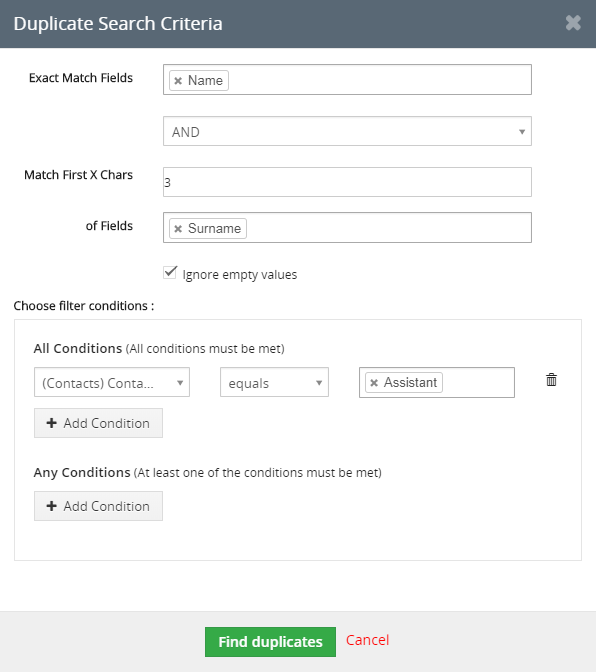 Exact Match Fields: These are the reference fields that need to be checked for duplicates. Fields selected here are exactly matched/compared with other fields (see below for comparison fields). Select an Extra Operator: This fields allow to add an extra reference to find duplicates. 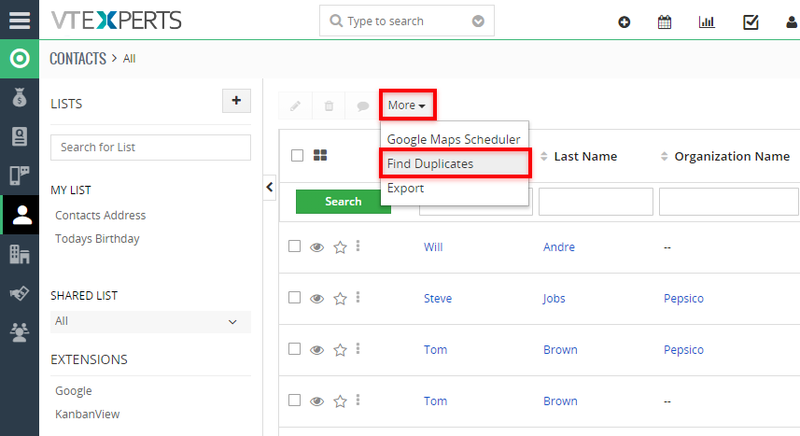 Once you select “AND”, it gives further fields to be used as reference while making the query to search for dupes. Match First X Chars: You can limit the search for first few number of characters. This is helpful in many cases, e.g. if you’re searching for dupes of “John”, who is also added as “Jonathan”, or “Junior” is also a duplicate as “Jr.” last name. Of Fields: Select the fields here for cross-check. So the fields from the “Exact Match Fields” are checked against the fields from the “of Fields”. For example, you can cross check “Surname” with “First Name”, “Office Phone” with “Primary Phone” etc. Ignore empty values: This is a standard option to avoid records with empty values of the select fields. Choose filter Conditions: Here you can add conditions to filter the duplicate record results. The filters can be any field from the current or related modules. The filters can be more than one, in order to refine the duplicate results maximum as possible. For example, if you select opportunity status = closed won, it will show duplicates on the basis of the configured fields from “Exact Match Fields” and “of Fields” for only those opportunities, which have status = closed won. Or you can ignore the duplicates if records’ Next dates are not within 1 year etc. We also added some custom columns to the result page. 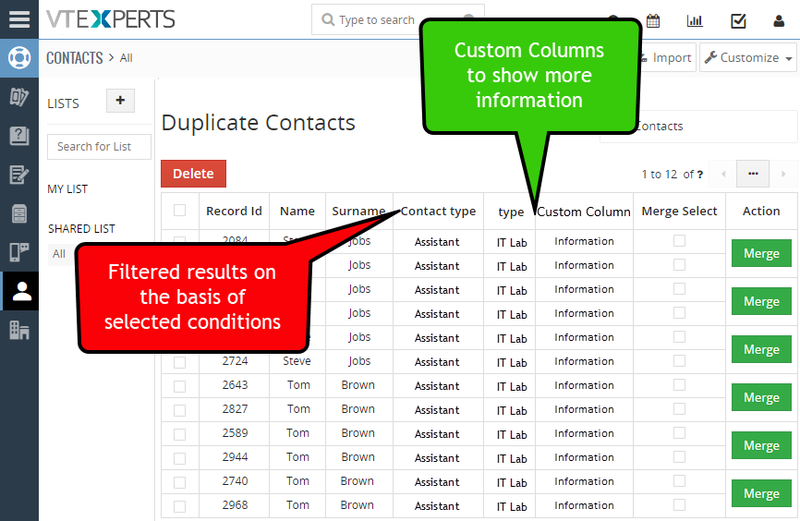 Those columns are from any field in VTiger and displays the data from it. That means, the result will not only show the select fields, but also the fields that are customized to be shown. 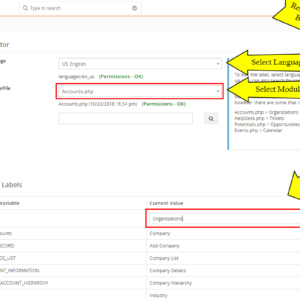 These are just few examples of how this customization can help refining the search results for duplicates from CRM. It can be used in a hundred of ways. We have also done hundreds of customizations – some of which are mentioned here. There are also countless more that are not mentioned here. So if you have a specific requirement that’s not enlisted, simply send us an email to [email protected] or join one of our experts via webchat.